[C. J. Traviès, Swiss-born French artist and engraver.] Hand-coloured proof of his lithograph 'Club jesuitique'. [Paris, 1830.] Only the title beneath the engraving; no publication details. 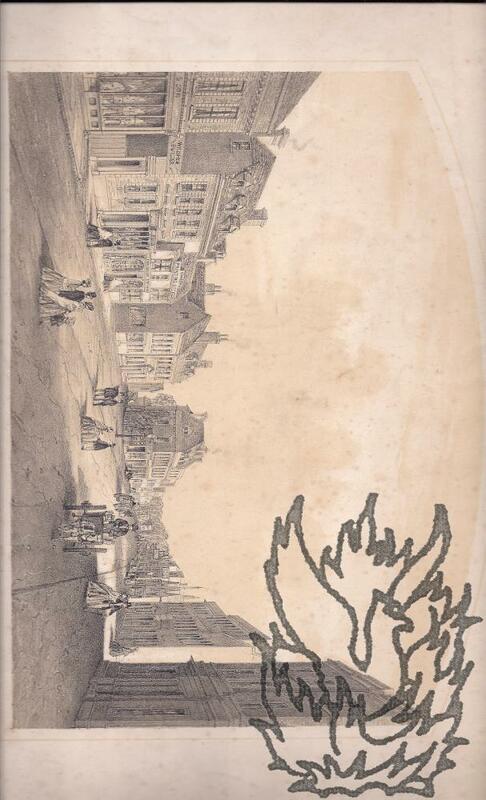 On one side of a 38 x 24 cm piece of wove paper with watermarked date 1828. In fair condition, lightly worn and creased. The engraving is roughly 21 cm square, and shows three figures gathered around a table, their arms tangled as they reach forward to sign a document. [ Delhi Durbar, 1903. ] Two lithographed maps: 'Camp of His Honour the Lieutenant Governor of Bengal' by Major James Strachey, and 'Plan showing the Disposition of Troops and General Arrangements'. 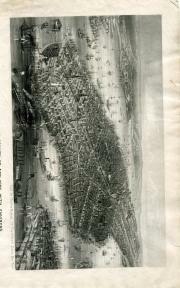 Both items dated December 1902, and by S. I. O. Calcutta. The 1903 Delhi Durbar was held to celebrate the succession of Edward VII and Alexandra of Denmark as Emperor and Empress of India. Devised and overseen in meticulous detail by Lord Curzon, this two-week display of pomp and power was easily the grandest of the three Durbars. Edward did not attend, but sent his brother the Duke of Connaught in his place. No other copies of the following two items have been traced, either on OCLC WorldCat or on COPAC. Twenty-four original outline lithographic illustrations to Shakespeare: a series of twelve anonymous ones to 'The Tempest', published in London in 1825 by Charles Knight; and a series of twelve by Moritz Retzsch to 'Macbeth'. The 'Tempest' illustrations 'Published by C. Knight, Pall Mall East, April 1825'. Retzsch's 'Macbeth' illustrations undated [1833 or 1847. All twenty-four illustrations have been laid down on leaves removed from an album of prints. Both series are numbered to twelve, and each is complete. The plates in the Retzsch series appear to have had their margins cropped. 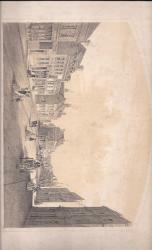 All images clear and complete, on lightly-aged paper, with occasional light spotting and discoloration. Laid down at the head of the first illustration in the first series, and slightly (0.5 cm) encroaching onto it, is a printed label reading 'Illustrations to Shakespeare's | TEMPEST | in 12 plates'. [Louis Haghe, artist and engraver.] Autograph Letter Signed ('L. Haghe') to an unnamed correspondent, regarding the contribution of two paintings to a conversazione, and his brother Charles Haghe. 6 Upper Belmont Place, Wandsworth Road [London]. 28 May 1860. 1p., 12mo. In good condition, lightly aged and worn, with 'Conversazione' in a contemporary hand at head of first page. Addressing his letter to 'Dear Sir', Haghe begins by acknowledging the receipt of 'a card for the conversasione [sic] of the 5th. of June next', adding that he will be pleased 'to send you a couple of pictures at the appointed time'. He gives the dimensions of the two pictures. He ends by reminding the recipient that 'my brother Charles has not yet received the card you have usualy [sic] been kind enough to send him'. [John B. Gough, 'the Apostle of Cold Water', American temperance orator.] Lithographic handbill titled 'John B. Gough's Beautiful Peroration on Water', the text accompanied by a portrait of Gough on stage, holding up a glass of water. 'Published by E Tisdall No 5. Church St Kensington [London]'. Undated [1850s?]. 1p., 12mo. In fair condition, on lightly-aged paper, with small piece cut away from one corner, and traces of mount adhering to the blank reverse, which also carries a few marks in ink, with a couple of minor marks in the margin at the foot of the recto. At the head of the page is the engraving, roughly 12.5 x 12 cm, attractively done, and showing Gough in cutaway jacket and waistcoat, standing behind a table, with a seated audience behind him, holding aloft a glass of water. [Nineteenth-century coach building.] Lithographed handbill advertisement for 'Wright's Patent Drag' (i.e. brake for a horse-drawn coach), with two illustrations by Baddeley, and four testimonials. With accompanying engraving. Text: 2pp., foolscap 8vo (35 x 20.5cm.). Engraving: 12 x 16cm with corners clipped. Both items in fair condition, on aged paper. The text is cropped at the head, through a royal crest, and has rounded corners at the head and trimmed corners at the foot. The engraving has traces of grey paper mount on reverse. The text has lithograph illustrations of two side-views of four-wheel carriages with the drag applied, beneath the cropped crest and above the title 'WRIGHT'S PATENT DRAG.' Text consists of around 60 lines in copperplate. The original lithograph of Samuel Prout's 'A Drawing on Paper transferred on Stone', showing a dockside water pump, from the English edition of Alois Senefelder's 'Complete Course of Lithography' (1819). On a piece of paper 20 x 22.5 cm, with the dimensions of the image 16.5 x 22 cm. Caption at foot: 'A Drawing on Paper transferred on Stone', with 'Drawn by S. Prout' beneath the bottom left-hand corner of the image. In fair condition, on lightly-aged paper, with the image clean, and foxing to the caption strip at the foot. Laid down on a leaf removed from an album. The original print, from the English edition of Senefelder's book, published by Ackermann in 1819, and not the version reprinted in 'Lithography and Lithographers' by E. R. and J. Pennell (London: T. Fisher Unwin, 1915). Original lithographic engraving by Dupare, from a drawing by Arago, of 'Nouvelle Hollande. Vue d'une partie de la presqu'île Péron, et 1re entrevue avec les sauvages', depicting a meeting of Aborigines and Frenchmen at Shark Bay, Western Australia. Dimensions: 18.5 x 25.5 cm. Laid down on a piece of 19.5 x 26.5 cm grey paper. The print has been trimmed, so that there is no margin. In good condition, lightly-aged and ruckled. Against a rocky backdrop, with aborigines viewing from the top of a hill, a group of six aborigines are shown to the right, naked and waving sticks and spears. To the left are the five Frenchmen, with a stack of rifles in front of a tent at far left. In the centre of the image the leading Frenchman places gifts on the end of a long stick held by one of the aborigines. Autograph Letter in the third person to 'Miss Cole' [perhaps daughter of collector Robert Cole] declining to engrave her work, as he has 'found the copying miniatures so injurious to his eyes'. 11 Chester Place, London. 29 January [no year]. 2pp., 16mo. On bifolium. Good, on lightly-aged paper. After presenting his respects, Lane states that he'regrets that he is so engaged for three or four months that he must not undertake any more - / He has found the copying miniatures so injurious to his eyes and the drawings so unsatisfactory in the printing that he is at all times unwilling to engage in very small Drawings -'. He concludes by thanking her for 'her most kind & gratifying note'. Lithograph of drawing of Thomas Hardy by Sir William Rothenstein, from his series 'English Portraits' (1898), printed by Thomas Way. Printed in black and white on piece of paper approximately 24.5 x 27.5 cm. In good condition, on lightly-aged paper. Tipped in into modern white card mount with window frame. From his series of 'English Portraits' (1898). A facsimile of Rothenstein's initials and his dating are in the bottom left-hand corner of the engraving ('W. x R 97'), with Way's slug in the bottom right-hand corner. Fine representation of Hardy, staring warily at the viewer with hands in pockets. 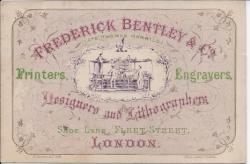 Trade card for 'Frederick Bentley & Co. (Late Thomas Harrild.) Printers, Engravers, Designers and Lithographers, Shoe Lane, Fleet Street, London', with engraved illustration of works on one side and 'Almanack for 1870' on the other. Landscape card, 7.5 x 11.5 cm. Designed to show off the firm's capabilities, and printed on one side in purple, green, light brown and gold, with fancy lettering within florally-decorated body and border, around a small central illustration of three men working a press. Printers' details in small letters at foot, reading 'F. Bentley & Co. Lth' and 'Shoe Lane, London.' The almanac on the reverse is a more restrained affair, stylishly printed in purple and gold. Fair: lightly-aged, with small closed hole to one corner, and slight wear at foot of almanac. Original sepia lithograph engraving, titled 'Newland Street, Witham', and showing the offices of the printing office and bookshop of the print's publisher R. S. Cheek. On piece of paper roughly 29.5 x 44 cm. The image itself is 30 cm wide, with an arched top 18 cm high at sides and 22 cm at the highest point. 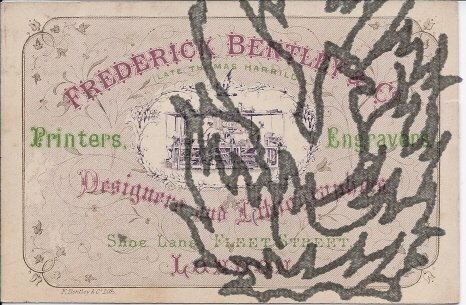 The image is clear and complete, on dusty spotted paper with fraying and loss to top edge especially. A charming image, showing Victorian middle-class townsfolk comporting in the town centre, with a wide main street with two carriages, and shop names including 'ELLIS' and 'WILSHER BUILDER'. Towards the centre is 'CHEEKS PRINTING OFFICE', 'BOOKSELLER STATIONER'. 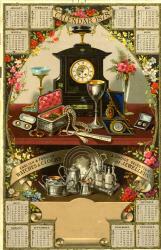 Illustrated chromolithographic printing proof of 'CALENDAR 1878 | ENGLISH & FOREIGN WATCHES & CLOCKS | A CHOICE SELECTION OF JEWELLERY'. Printed on one side of a piece of stiff art paper (shiny on printed side, matt on reverse), dimensions roughly 245 x 160 mm). Very good. The name of the firm is not stated, and dabs of colour in 3 mm margins as printing guide. Attractive and characteristic illustration, in eight (?) 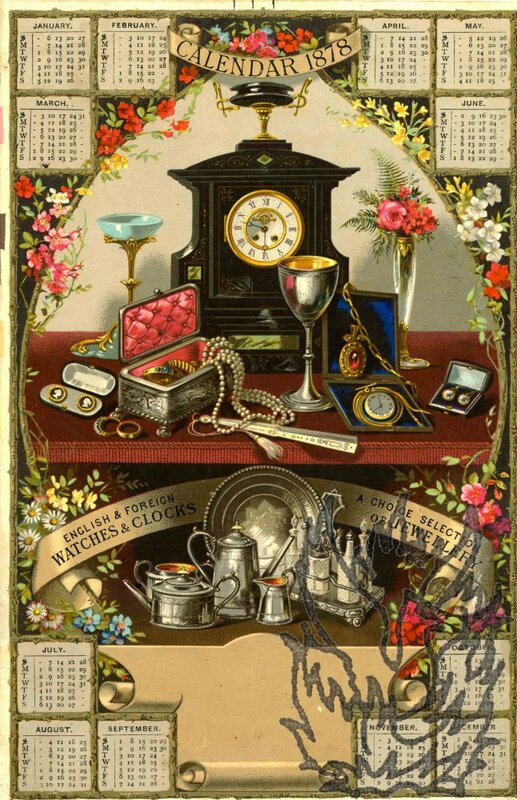 colours: dark brown, beige, green, red, pink, yellow, dark and light blue, showing a carriage clock surrounded by plate, jewellery (including a goblet, a fan, a pearl necklace, a fob watch, decanters) and a profusion of flowers. The calendar in twelve tiny squares, six at the head at six at the foot. Coloured lithographic portrait engraving of 'THE RIGHT HONBLE. WILLIAM PIT. | From an original drawing by the late Mr. Sayers in the possession of Francis Turner Esqr. | Drawn on Stone by R. J. L. [i.e. Richard James Lane]'. EXCESSIVELY RARE. Apparently not present in the National Portrait Gallery collection. The portrait is on a piece of India paper roughly four and a half inches by three and a half wide, mounted on a piece of thick wove paper roughly eleven inches by eight and a half wide. The mount bears the text. Good, though somewhat grubby, and with the mount lightly creased and foxed. While Sayers is best-known as a Pittite caricaturist this image is certainly not a caricature. Autograph Letter Signed to Alfred Edward Chalon. Belgrave place | Thursday Ev[eni]ng.' [no year]. English painter and sculptor (1781-1841). The recipient (1780-1860) was an English artist of Swiss descent. One page, quarto. Good, but with traces of previous brown-paper mount adhering to rear and minor damage to several corners. Reads 'My Dear Sir | When I asked you for an impression I had not seen the composition & had no idea that I was asking so much - believe me I feel very grateful for your kindness in putting me in possession of so very interesting a work - I do not mean to be understood as speaking of Lithography only.